Above, “Come As You Are” and “You Lift Me Up” performed by Soldiers of Light. As thunderstorms loomed early Sunday evening, the young voices of Hawaii’s Soldiers of Light Choir lit up the night in Houston, Texas. 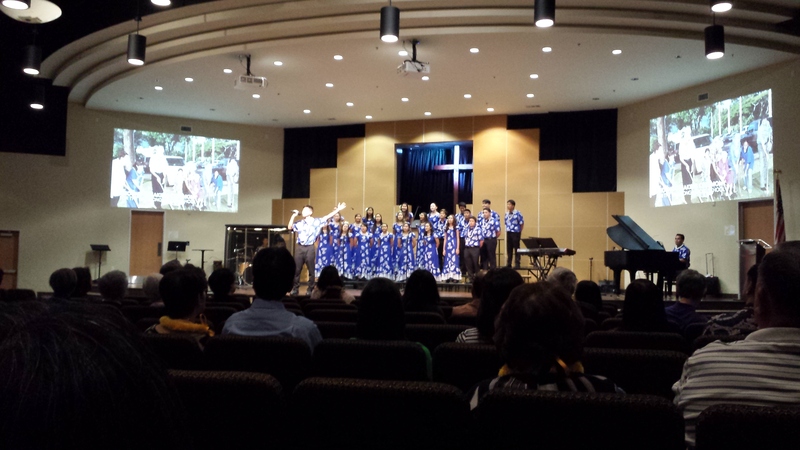 Tonight, the Soldiers of Light shared their love of God and faith in Christ through uplifting music, hula and personal testimony at Chinese Baptist Church. For some, it was like being in Hawaii, too. “Every 5 years, the Soldiers of Light tours. We are happy and fortunate to have them here,” said CBC Senior Pastor Dan Ho. Ho added the concert was live-streamed Sunday night. The Soldiers of Light began 28 years ago when 8 students met after school and on weekends to sing at churches and other events in Oahu. The Soldiers of Light have performed at various churches in Oahu and nearby islands. 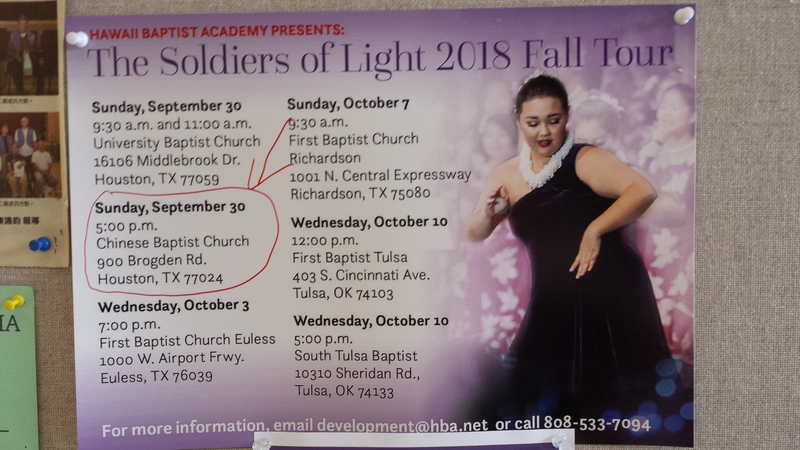 Tonight’s concert at Chinese Baptist Church is the second stop on the Soldiers of Light Fall Tour 2018. On Sunday morning, the Soldiers of Light performed at University Baptist Church in Houston. The group performs October 3 at First Baptist Church in Euless, Texas, Oct. 7 at First Baptist Church in Richardson, Texas and winds up their tour with 2 concerts at First Baptist Church in Tulsa, Oklahoma. For more information, email development@hba.net or call 808-533-7094. This entry was posted in Asian Community, Asian Community Houston, Church News, Get to know Christ, Harris County News, Houston News, Texas News and tagged Hawaii Baptist Academy Soldiers of Light Fall Tour 2018, Hawaii Soldiers of Light, Soldiers of Light Fall 2018 Tour. Bookmark the permalink.